If you are looking for some online space to deliver your thoughts and ideas without investing a single penny, then this free WordPress theme for writers is a great option to craft a website with elegant look and sophisticated design. It suits writers and authors, bloggers, journalists, news and magazine sites, online book stores, publishers, libraries, literature lovers and every website related to writing. Its structure is so well designed that users will never distract from the main content. It has great compatibility with WooCommerce plugin which makes selling digital and physical goods an effortless task. Not just that, it is compatible with most of the third party plugins to include specific functionality without hampering website working. This free WordPress theme for writers is easy to install and configure, and with the vividly explained documentation, this task has never been so easy. Upload your own logo and change slider settings to make your website more impactful. 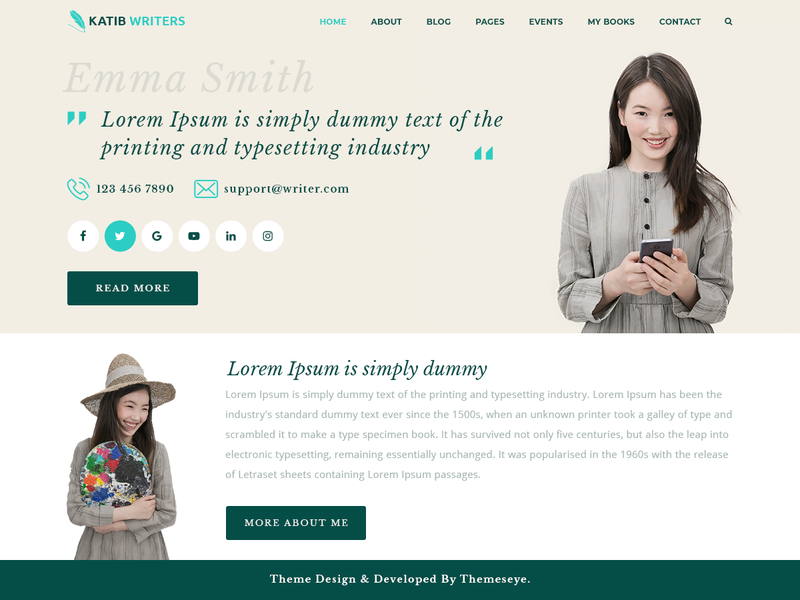 This free WordPress theme for writers is fully responsive making your content accessible from mobiles, tablets, laptops and desktops of any screen size and resolution. It has a great scope for new bloggers and writers who don’t want to step in to complex coding. It loads coherently on all browsers and can be translated into any of the 70+ language it supports. The developers of this theme have smartly placed call to action (CTA) button and an impressive homepage slider to catch visitors’ attention at the very first time. Its fast loading pages, SEO friendly code and plenty of social media icons make this theme a user-friendly one to give them the best experience.